I am a big fan of Drs. 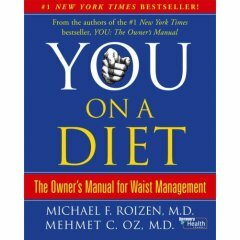 Oz and Roizon, the authors of the YOU books, YOU on a Diet, YOU Staying Young, etc. I have read them and recommend them. I saw an ad that described them as “Serious science presented to you in a highly digestible way.” I think that is exactly right. On the premise that Americans find filling out their tax forms easier than following dietary info, Dr. Oz offered several simple guidelines for losing weight and reducing belly fat. 1. Don’t eat foods with added sugars or added syrups. When possible, avoid artificial sweeteners, too. They lie to your appetite control system and can lead to weight gain. 2. Choose 100% whole grains. Your guts, immune system, and heart will thank you. 3. Eat slowly so you can tell when you’re full. Then stop. 4. Eat often (4 to 6 times a day) to prevent hunger. Hunger leads to overeating, which is bad for the heart and triggers weight gain. 5. Get nine servings of fruits and veggies a day. Think of it as nine fistfuls of goodness. 6. Opt for lean protein. Good sources include chicken (no skin), fish, beans, and whole grains. Spare your heart and brain the damage that too much saturated fat causes. 7. Get a blood test to check your levels of vitamin D and B12. Take supplements if you’re deficient. I think these are a good supplement to my How to Lose Weight – And Keep it Off page.